FEINER CAMPAIGNS AGAINST EDGEMONT FIRE DISTRICT BOND | The Edgemont Community Council, Inc. Within a week of killing at least for now an Edgemont sidewalk initiative to give children a safe way to walk to and from Edgemont’s elementary schools, Town Supervisor Paul Feiner is now looking to kill the Greenville Fire District’s proposal to borrow up to $550,000 to pay for what the Town itself has warned Edgemont school and fire districts will be an unprecedented one-time only five-fold increase in tax certiorari refunds in 2015. Mr. Feiner contacted newspaper reporters this week in an effort to drum up negative publicity in an effort to defeat the proposed borrowing. Mr. Feiner, who does not live in Edgemont, told the Journal News he would rather see Edgemont’s fire district pay for the huge hike in upcoming Town-negotiated tax cert refunds by cutting its $9 million annual budget. Fire district commissioners felt that sudden forced spending cuts of that magnitude would put Edgemont’s fire protection services at risk. The fire district’s five commissioners unanimously decided to seek voter permission to borrow for the refunds after the district was notified by the Town that it should expect an unusually high refund bill in 2015, following an onslaught of tax claims in advance of the town’s revaluation project that’s now under way. Earlier this week, the Edgemont Community Council voted unanimously to support the fire district’s bond proposal. Mr. Feiner’s attempt to influence the outcome of next week’s bond vote in Edgemont is sure to remind Edgemont residents of his campaign a few years ago to consolidate Edgemont’s fire district with that of fire districts in Hartsdale and Fairview which, had Mr. Feiner succeeded, would have resulted in an immediate 24% hike in Edgemont’s fire taxes. That effort failed. And some Edgemont residents are still angry with Mr. Feiner over his attempt a few years ago to wage a campaign to defeat Edgemont’s school budget, which included, among other things, his providing opponents with mailing lists, contact information and phone numbers for the automatic telephone dialing service Mr. Feiner uses for his political campaigns. That effort also failed. Mr. Feiner’s opposition to borrowing to cover the fire district’s unanticipated one-time only tax cert obligations is ironic because the Town last year was forced to borrow $5.5 million to cover the cost of a $6.5 million settlement of the Fortress Bible litigation in which Mr. Feiner was found liable by a federal court for having intentionally violated the constitutional rights of a church seeking to build a sanctuary and school on church-owned property off of Dobbs Ferry Road. The $6.5 million settlement is believed to be the largest settlement in the United States that any municipality has had to pay to settle claims of religious discrimination. At the ECC meeting earlier this week, Mr. Feiner denied that the Town had ever warned school and fire districts to expect a huge increase next year in tax cert refunds, and said he was unaware that deputy town attorney Peter Carparelli, who is responsible for the handling the Town’s tax cert litigaiton, had been providing such information to the Town’s school and fire districts since 2007. Because of Mr. Feiner’s well known reputation for being spiteful when publicly embarrassed, some officials are now worried that Mr. Feiner may now order Mr. Carparelli to stop providing such information in the future — leaving school and fire districts to guess what their future tax cert refund obligations might be. 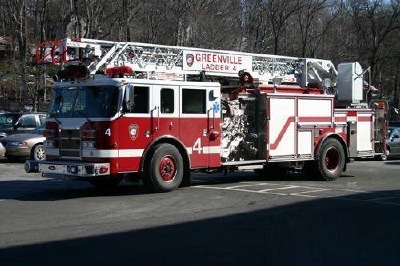 Even though the Town itself has no legal responsibility for the Town’s fire districts, Mr. Feiner’s intervention in fire district elections this year is not limited to Greenville. Mr. Feiner is apparently backing candidates for fire district commissioner in both Fairview and Hartsdale. Earlier this week, he used the Town’s email list to promote the candidacy of his candidate in Fairview by enlarging that candidate’s name when listing the names of all three candidates on the ballot there. Mr. Feiner later apologized and said, as he has said before when inappropriate material under his name is sent to residents on the Town’s email list, that he didn’t know how it happened. In addition to the tax certiorari bond question, Edgemont voters are being asked to approve borrowing of up to $950,000 to purchase a new ladder truck to replace a 13-year old truck that the district says has outlived its useful life , as well as borrowing of up to $285,000 to cover the cost of deferred maintenance needed on the firehouse itself. Polls will be open at the Greenville Firehouse this coming Tuesday from 2 p.m. to 9 p.m. This entry was posted in Covered by LoHud, Litigation, Town Board, Town of Greenburgh. Bookmark the permalink.